Theoretical Model of Conscious Presence now published in Frontiers of Consciousness Research! The paper “An interoceptive predictive coding model of conscious presence” has just been published in Frontiers of Consciousness Research by Anil K. Seth and Keisuke Suzuki from University of Sussex, and Hugo D. Critchley from Brighton and Sussex Medical School. The paper looks at the mechanisms underpinning the subjective sense of presence, a basic property of normal conscious experience. We describe a theoretical model of the neurocognitive mechanisms underlying conscious presence and its disturbances. The model is based on interoceptive prediction error and is informed by predictive models of agency, general models of hierarchical predictive coding and dopaminergic signaling in cortex, the role of the anterior insular cortex (AIC) in intero- ception and emotion, and cognitive neuroscience evidence from studies of virtual reality and of psychiatric disorders of presence, specifically depersonalization/derealization disor- der. The model associates presence with successful suppression by top-down predictions of informative interoceptive signals evoked by autonomic control signals and, indirectly, by visceral responses to afferent sensory signals. 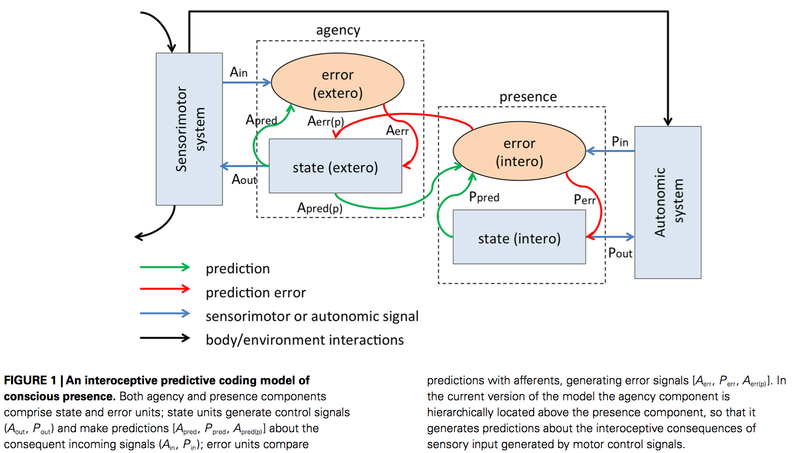 The model connects presence to agency by allowing that predicted interoceptive signals will depend on whether afferent sensory signals are determined, by a parallel predictive-coding mechanism, to be self-generated or externally caused. Anatomically, we identify the AIC as the likely locus of key neural com- parator mechanisms. Our model integrates a broad range of previously disparate evidence, makes predictions for conjoint manipulations of agency and presence, offers a new view of emotion as interoceptive inference, and represents a step toward a mechanistic account of a fundamental phenomenological property of consciousness.